LEN - www.lankaenews.com | Will Ranil be able to halt the illicit Titania deal involving billions of Gamarala and his son in law ? 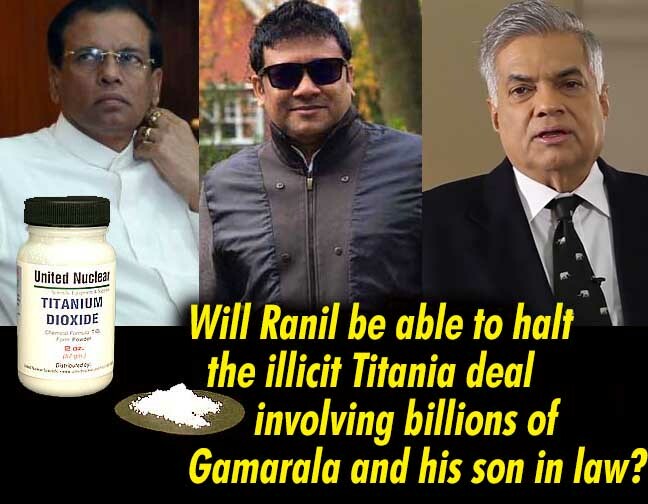 Will Ranil be able to halt the illicit Titania deal involving billions of Gamarala and his son in law ? (Lanka e News -20.June.2018, 7.00AM) It has come to light that the president and his wheeler dealer son in law are seeking to sell a most valuable commodity in the world which is available in Sri Lanka to Japan on the sly to become instant billionaires. While they are having secret discussions with Japanese millionaires to the detriment of the country , the prime minister on the other hand has held official discussions in London to confer the benefits thereof on the country , based on reports reaching Lanka e news . The most valuable commodities in the world today are gold, diamonds and Titania ( Titanium Dioxide ) .This commodity is obtained from Ilmenite a kind of mineral sand. Currently the market price of Titania is US dollars 1.6 million per kilo which in SL rupees is approximately 256 million. Along the coastal strip from Pulmoddai downwards , ilmenite which can produce Titania is generated .Right now the ilmenite in its raw form is being sold at a paltry price instead of being turned into the most valuable Titania aforementioned . If only Titania can be turned out in SL, all the country’s debts can be repaid within two years , and the country can be transformed into a wealthiest state, in which event if those who are shouting hoarse in the streets that they have no jobs and get attacked by tear gas are asked to stay at home and given food free ,even then it will not be a loss. However there is an unfortunate side to this – SL does not have the high cost technology to convert Ilmenite to Titania. Our president Pallewatte Gamarala who is also the minister of environment well noted for having a roving eye to seize opportunities where he can make a fast buck on the sly realizing this is where his fortune lies even at the expense of the country joined with a billionaire Japanese company and planned a joint venture with a view to pocket a share of the profits .. The president had discussions in this regard during his tour of Japan , and for the final discussions he appointed his wheeler dealer son in law Thilina Suranjith .According to reports reaching Lanka e News, Thilina has visited Japan on three occasions after president’s Japanese tour, in this connection. One can verify the truth of our allegations if one examines the passport of Thilina. Even last week Thilina was in Japan . All these are for clandestine discussions. Meanwhile Ranil Wickremesinghe who is currently on a tour of Britain had official discussions with British Minister of State for Trade and Investment Greg Hands pertaining to Britain’s trade policy with a view to appropriate the benefit of this huge valuable natural resource for the country. The P.M.’s media division revealed that the discussion between Hands and P.M. centered on foreign investment in this SL’s most common mineral resource project; and the possibility for England to provide the financial resources and necessary technology in this direction. The possibility of British common law operating within Colombo Port city which is going to be an international financial headquarter in the future was also discussed , the P.M.’s media division disclosed. It is most intriguing, when president through his son in law is on the sly having discussions surreptitiously with Japanese billionaires with regard to this Titania deal , in profound contrast the P.M. is having frank and open discussions officially with British trade policy minister in the best interests of the country . How bizarre ? Let us issue a dire warning that LeN is keeping a watchful eye over the moves and maneuvers of president Pallewatte Gamarala who is now precariously clinging on to a meager 4 % popularity base , and on the verge of being thrown out from the post , and therefore doing everything possible to earn most fast and big before he meets his final disastrous end which is imminent and ominously staring in his face .